“Anne and I are saddened by Engineer Cory Iverson’s tragic death. His bravery and years of committed service to the people of California will never be forgotten. “Engineer Iverson, 32, of Escondido, died today while fighting the 242,500-acre Thomas Fire near Fillmore in Ventura County. Engineer Iverson was an 8-year veteran of CAL FIRE. “He is survived by his wife, Ashley, who is pregnant, and their two-year-old daughter, Evie; mother, Denise Butler; stepfather, Scott Butler; and father, Craig Iverson. Iverson, a fire apparatus engineer, “succumbed to fatal injuries while engaged in fire suppression efforts on the Thomas Fire,” according to a statement from Cal Fire San Diego. 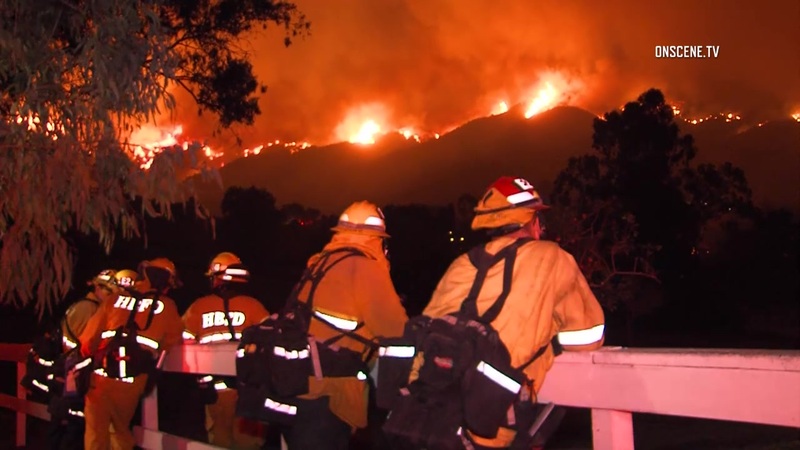 Iverson was assigned to the Thomas Fire as part of a fire-engine strike team from Cal Fire’s San Diego unit. Despite the traumatic loss off a valued colleague, firefighting personnel “must keep our focus on the fire,” Pimlott said. The Thomas Fire has charred about 242,500 acres and destroyed nearly 1,000 structures since erupting north of Santa Paula 10 days ago, making it the fourth largest blaze in California history. It was roughly 30 percent contained as of Thursday afternoon, according to Cal Fire.